Nick Schultz | The Phoenix Members of the the men’s volleyball team rally on the sideline after a play. Sophomore outside hitter Devin Joslyn shows his bruises after receiving cupping therapy. A lot of work the Loyola men’s volleyball team puts in before a match largely goes unnoticed. The high flying serves and thunderous blocks take countless hours of sprinting in a hot gym after a match and lifting weights early in the morning. 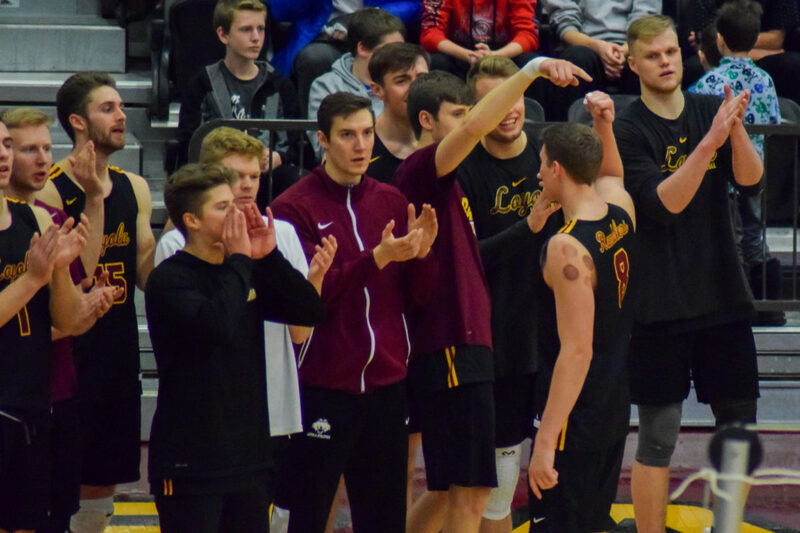 Loyola head coach Mark Hulse said he’s always prioritized getting the team into the best shape possible. Early morning practices, late night weight lifts and practicing for hours on the beach are some of the ways Hulse gives his team a physical edge night in and night out. Hulse said the important aspect of training is managing the workload of players to prevent injury. The players are constantly working with the assistant athletic trainer for men’s and women’s volleyball, Peter Higbie. Higbie said he does everything he can to keep the players loose and ready for every game, such as utilizing the hot tub in the training room. Training in the gym or on a treadmill is only half the battle, getting the most out of training depends heavily on a steady and healthy diet, according to junior middle blocker Kyle Piekarski. Standing at 6-foot-8, Piekarski said he has to have a diet that reflects his size. Piekarski said his training heavily relies on having easy access to food as he will constantly snack before, during or after workouts to promote muscle growth. He said during his first year, dining on campus was a “go-to” and the team could always go and eat there together. Piekarski said the work the team puts in during the offseason is what gives the players an edge during the regular season. Loyola will often work out and practice on beaches to build muscle as the sand makes movement more difficult. Senior opposite hitter Dane LeClair said the Ramblers always train together throughout the day. He said the players are always hitting the weights together as a team and work out over the offseason together to build up communication and team chemistry. The hardest part of volleyball is getting up to the net countless times throughout a match, according to LeClair. He said everyone works with athletic trainers and coaches to get their vertical leaps as high as possible. Higbie said the hardest part of training is maintaining the same level of intensity day in and day out. Games on the road or any back-to-backs prove to be quite a challenge for the training staff as those kinds of games put a lot of stress on the body and are where injuries occur most, according to Higbie. Despite the difficulty of being a student athlete, Hulse and Higbie praised everyone’s dedication to improvement. The volleyball season can seem endless due to the daily grind of being a student-athlete, but the team has maintained its intensity during daily training, according to Hulse. The Ramblers are scheduled to continue their season April 5 when they take on Lindenwood University at Gentile Arena. First serve is scheduled for 7 p.m. and the match will be broadcasted on ESPN3.